Handbill published by the New York State Woman Suffrage Association. BECAUSE women must obey the laws just as men do, They should vote equally with men. BECAUSE women pay taxes just as men do, thus supporting the government, They should vote equally with men. BECAUSE women suffer from bad government just as men do, They should vote equally with men. BECAUSE mothers want to make their children's surroundings better, They should vote equally with men. BECAUSE over 5,000,000 women in the United States are wage workers and their health and that of our future citizens are often endangered by evil working conditions that can only be remedied by legislation, They should vote equally with men. BECAUSE women of leisure who attempt to serve the public welfare should be able to support their advice by their votes, They should vote equally with men. BECAUSE busy housemothers and professional women cannot give such public service, and can only serve the state by the same means used by the busy men--namely, by casting a ballot, They should vote equally with men. BECAUSE women are sonsumers, and sonsumers need fuller representation in politics, They should vote equally with men. BECAUSE women are citizens of a government of the people, by the people and for the people, and women are people. They should vote equally with men. EQUAL SUFFRAGE FOR MEN AND WOMEN. BECAUSE Women Ought to GIVE Their Help. Men Ought to HAVE Their Help. The State Ought to USE Their Help. New York State Woman Suffrage Association. Acknowledgment of Virginia Commonwealth University Libraries as a source is requested. New York State Woman Suffrage Association. , “Votes for Women! The Woman's Reason. 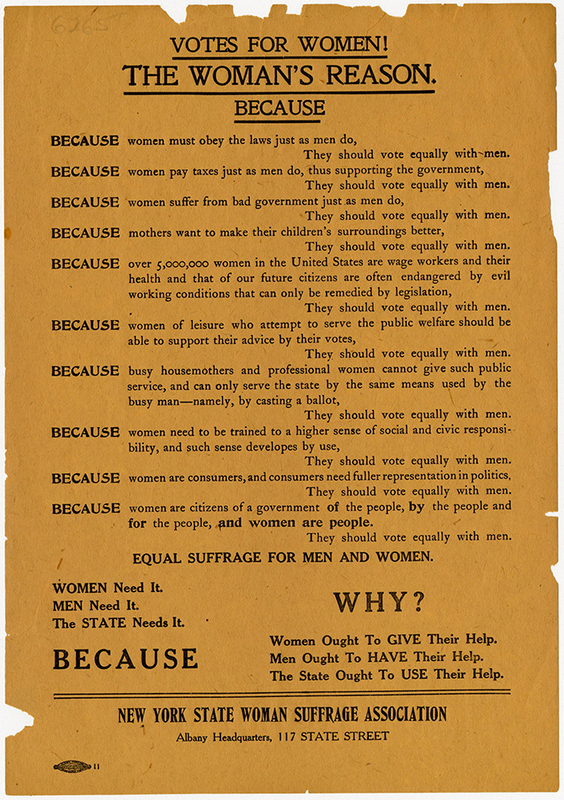 Because [suffrage handbill],” Social Welfare History Image Portal, accessed April 24, 2019, https://images.socialwelfare.library.vcu.edu/items/show/427.